CTbites has been following Greer Fredericks since she opened Mama’s Boy in Norwalk in 2013. She believed that low country southern cuisine could tantalize Fairfield County diners, from shrimp & grits, chicken and waffles to mile high desserts. Mama’s Boy’s food started the trend where down home, stick to your ribs cooking with bold flavors, deep fried, with cheese and calories were an accepted cuisine. Greer’s newest venture is Peaches’ Juke Joint, a fun-loving, take off your shoes, leave your inhibitions at the door and have some fun with a side of food. She hired Paul Failla to oversee the kitchen; many will remember Failla from his days at neighboring Bar Sugo. Ctbites was recently invited to sample Chef Paul’s newest creations and feel the vibes at Peaches. Beverage director Tom Siano likes to create a daily southern cocktail to feature from the bar, and the night's creation we sampled was inspired by a recipe from the bar at the Seelbach Hotel in Louisville, KY from the turn of the 20th century. 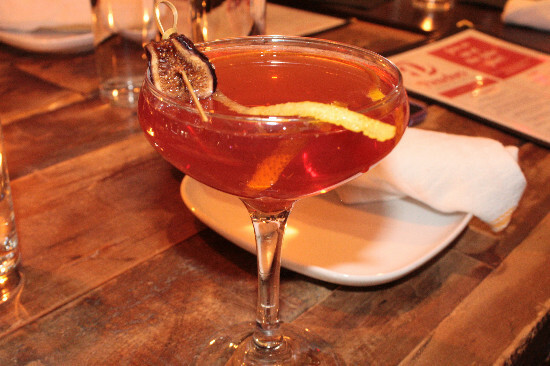 The recipe included black mission fig macerated Old Forester bourbon, Combier, Peychaud's and Angostura bitters, Prosecco, and garnished with half a fig and a twist of orange. The end result was quite naturally sweet, but deeply spicy with just a hint of fizz. The bourbon was pretty well cloaked under all those layers, and it was a drink which tasted sophisticated even before the booze hit. 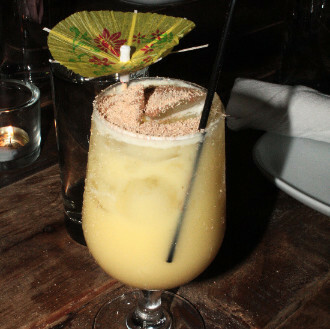 The Painkiller, with white rum, coconut cream, charred pineapple puree, and fresh OJ is an everyday item on the drink list. The fresh grated nutmeg strewn liberally over the drink's surface was key in adding a few studs to an otherwise velvety drink. It was a tasty coconut-plus-citrus concoction, but was much too sweet to have more than one. I moderated the effect by alternating sips with salty skin-on fries, which were excellent. There are a lot of appetizers and small, fun plates to choose from. Peach's deviled eggs may be the bridge to acceptance of this oft-times frowned upon classic. The hard-boiled eggs were brined in a beet-infused mixture to obtain a slightly iridescent purple-pink tone, topped with whipped yolks, crispy pork belly, and slices of pickled okra; we didn't let a single one escape the table. The brine of both the whites and the okra added a good acidity to the creamy yolk preparation, and the meaty crunch of the pork helped both flavor and texture. The eggs were served with a side of house-made pickled cucumbers and red onions, which both held a crunchy texture, and a bread and butter style sweet and sour taste. Country Fair Bacon is Peaches’ version of a corn dog and is best enjoyed while putting off that new year's resolution by another 365. Four globe-shaped lollipops started with thick cut pork belly, treated with Areppa pepper, maple syrup, rolled in funnel cake batter, deep-fried and served on a stick under a dusting a powdered sugar. A big bite can be overwhelming at first with a ton of sweet, heavy, oily dough, but it finished super strong with meaty, chewy bacon. This may not be a dish for most northern sensibilities, but it is spot on true to its name. We were not fans of the Dark and Stormy Ribs. They were first confit in duck fat before being coated with a sauce that included a mixture of ginger root, Myers dark rum, and simple syrup. 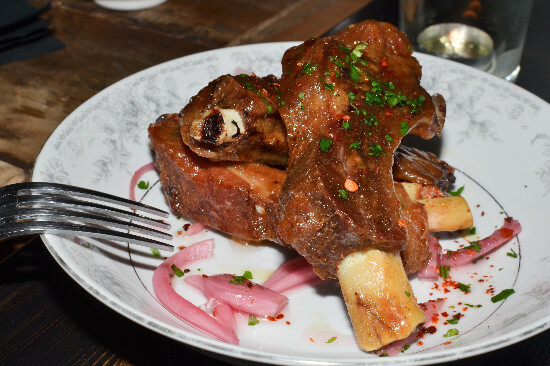 We thought these would be fall-off-the-bone southern ribs, but they were crispy on the exterior, spongy on the interior and lacked the craved meatiness. There are numerous down-home choices in the Supper section of the menu. Our favorite dish of the evening was the Pork Shank (pictured above). The meat was fall off the bone tender, moist on the interior and enveloped in a crispy sweet crust. 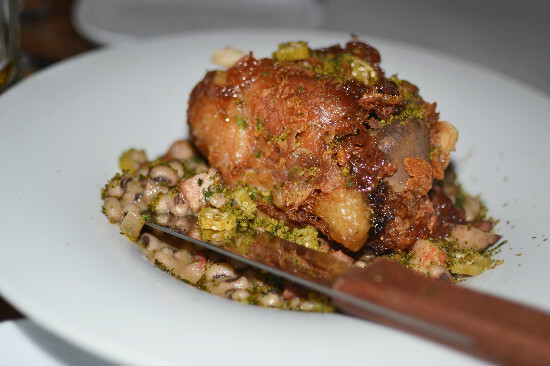 It was served atop a delicious bed of Hoppin' John, which combined black eyed peas cassoulet that were stewed with pork. it was the dish that delivered that signature Southern wake-up-the-taste-buds combination. The simplicity of the dish can deceive one into thinking it's easy to get right, and chef Failla absolutely nailed this one. This is a must order dish. 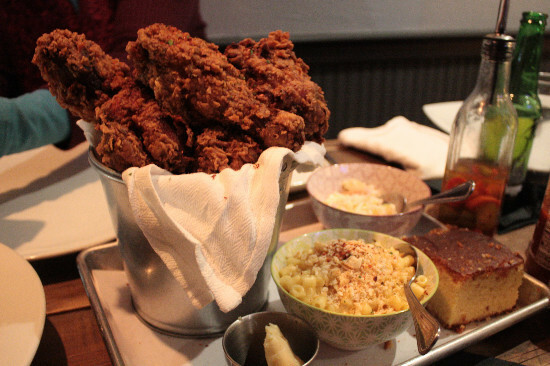 No Southern menu would be complete without fried chicken, and Peaches super-sized its offering with a tray that included a Bucket o’ Chicken (for two), cornbread and honey butter, slaw and a side. The chicken (breasts and thighs) was first rested in the ubiquitous house brine, then covered in a buttermilk batter before frying. The brine kept even the white meat juicy and flavorful, and the star attraction was right where it should be, in the skin and fried exterior. While the meat was incredibly juicy, the crust very thick, and we would have preferred a little more seasoning and salt. Between the chicken piled up above the metal bucket and everything else on the tray, this should easily satisfy two people. Our side was The ‘Merican Mac ‘n’ Cheese that combined little ditalini pasta in a bowl with a creamy combination of American and ricotta salata cheeses, sprinkled with Ritz crackers. This was both a simplistic and delicious mac & cheese, and the addition of the Ritz atop added a little crunch and saltiness. 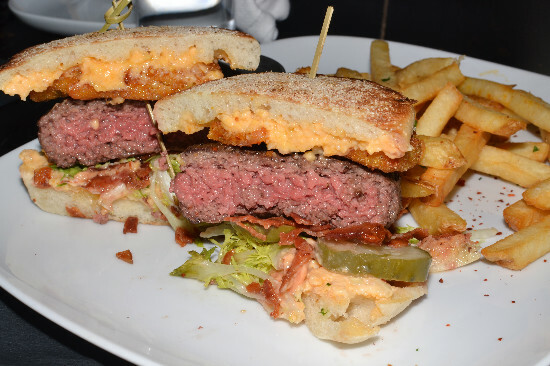 The Low Country Burger consisted of a large beef patty served on a toasted English muffin with shredded frisée, those house pickles, bacon, a slice of fried green tomato and a swath of Pimiento cheese. The patty had a loose grind, with a nice char that was perfectly prepared to medium-rare. The bacon was crispy and added saltiness, but the meat and the fried green tomato were a little under-seasoned. The cheese melted down slightly into an unctuous sauce, with a tiny bit of heat supplied by the pimentos, a little overwhelming for the other ingredients. The burger was accompanied by well-salted fries. 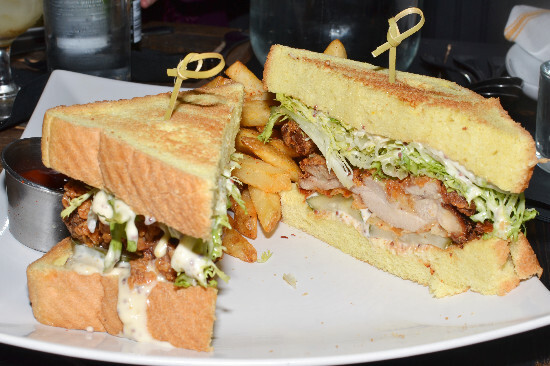 The Thigh High Chicken Sandwich started with two griddled slices of Texas toast surrounding several pieces of buttermilk-fried chicken thighs, a return of the house-made pickles, and a swath of white BBQ sauce. Like the burger, this sandwich was large and messy, packing tons of differing flavors. The chicken was perfectly fried, incredibly juicy, and was complemented by the sour pickles. Like the burger, this sandwich would have benefitted from a little more seasoning on the chicken. It was served with a mound of well salted, skin-on fries. The Mahi Mahi consisted of a small filet served atop several corn cakes, with creamed corn and apple slaw. We were not fond of this dish. The fish was screaming for spice, but there was very limited seasoning and the accompaniments also lacked any character. Peaches’ is a hoppin’ place where fun, frolic and food are the order of the day. Stuffiness is checked at the front door, calories are for another time, and friends join in to eat and share as many dishes as possible. This was a media event. Neither CTbites nor the authors were compensated for this review; the meal was provided without charge. The opinions contained herein are solely those of the authors.